Wow, another week has flown by in the house! 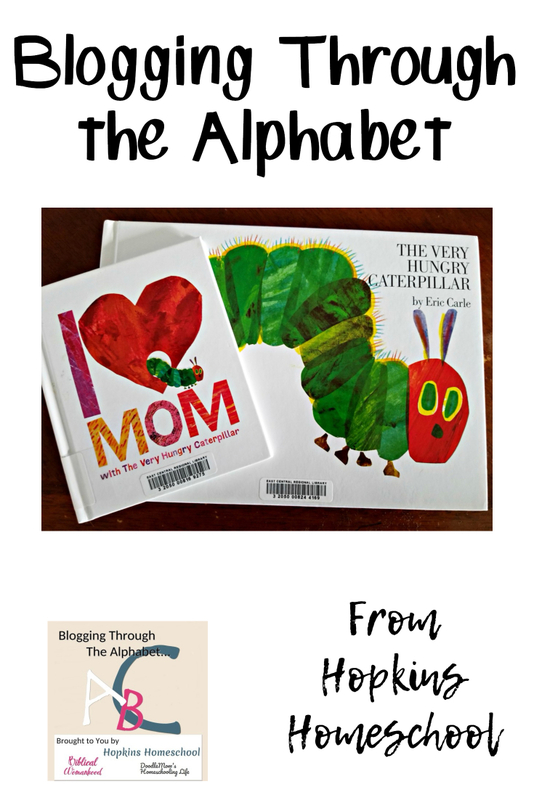 I can not believe we are onto the letter V already in our Blogging Through the Alphabet! This was me thinking and planning about our next adventure with this alphabet journey! Have you stopped by and said hello to my co-hosts, Kirsten from DoodleMom or DaLynn from Biblical Womanhood? I was worried about this letter, what would I pick? We are getting to some of the tough letters of the alphabet, and They can be hard, no matter what your topic is. 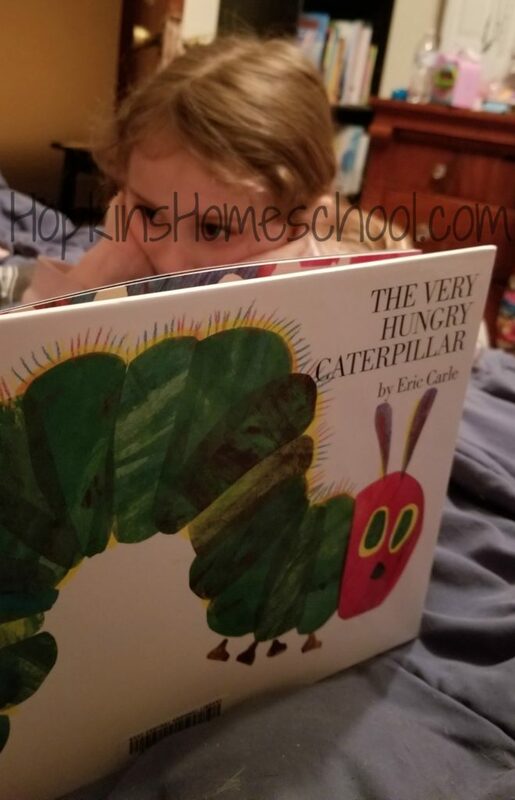 Finding a book that I have read for V seemed daunting at first, but I realized there was a favorite book that I almost forgot about, The Very Hungry Caterpillar by Eric Carle! Any book written by Eric Carle is an excellent book in my opinion! I love the artwork that goes with the story. The stories are simple, yet fun and engaging. My kids have always loved them. Just this week, March 20th, was The Very Hungry Caterpillar Day, so this just seemed like the perfect fit for this week! The Very Hungry Caterpillar is a fun book to read. The pages are cut out as the caterpillar eats through the various fruits and vegetables, but he also has a splurge day when he eats way too many sweets. When he gets a stomach ache from this, he decides to eat healthy again before making his cocoon. 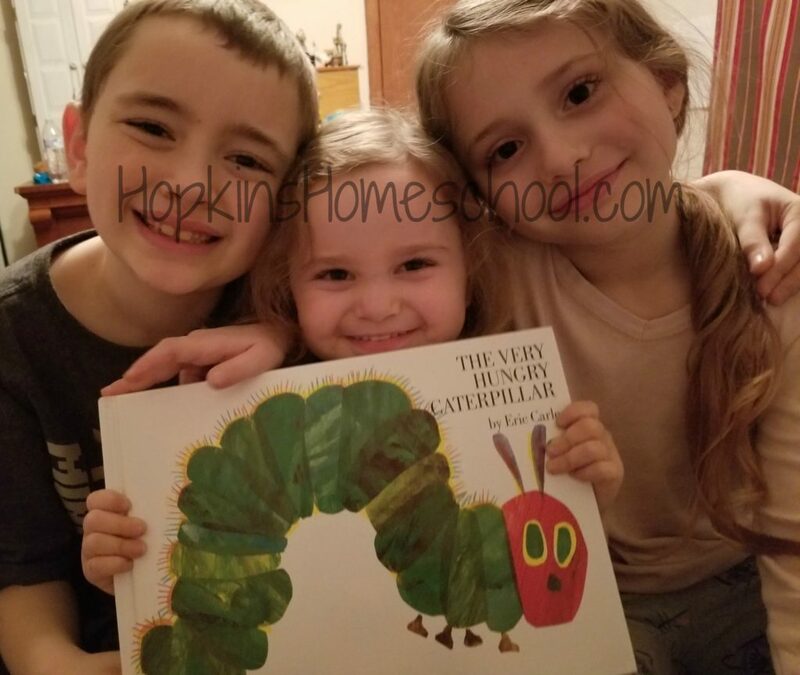 Not only is this a fun book about the science behind a caterpillar turning into a beautiful butterfly, but you are also able to use the stomachache as a learning time about healthy eating. My kids could certainly feel the pain as they saw how much junk food this poor caterpillar ate in one day! While I was walking around our library yesterday, I found another cute little gem, I Love Mom with The Very Hungry Caterpillar. While this has very little to do with the Very Hungry Caterpillar, he is pictured on every page of this story. This is one of those books that mom falls in love with and the kids can agree with. Is it wrong that Eric Carle books aren’t among my favorites? Maybe because I taught so many Reader’s Clubs when I worked at a zoo that focused upon his books. I think I prefer Lio Lionni children’s books. My kids loved that book when they were younger.